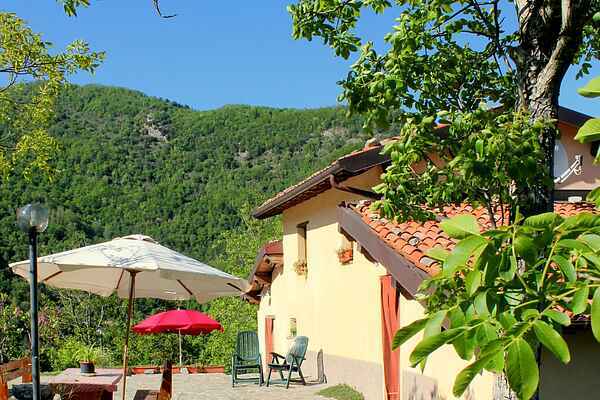 This delightful, renovated agritourismo is north of the ancient, historic city of Lucca. The rustic complex nestles in hills 550 metres above sea level. It has been carefully renovated while maintaining its traditional Tuscan style. The complex has a history dating from the 18th century. It enjoys a delightful view of the Alpi Apuane Mountain Range. The three holiday accommodations are ideally situated for a relaxing holiday. You can explore the surrounding countryside and enjoy nature at its best. The famous Grotto del Veneto (Wind Grottos) are nearby and worth visiting. The Tuscan coast and the Viareggio, Camaiore and Forte dei Marmi beaches are about sixty kilometres away. You can spend a delightful day on any of them. Lucca, the Garfagnana region, Pistoia and the rest of Tuscany are all well worth a visit. Visit this historic house that is already there since 1700. The restructuring has been done, trying to maintain the original architecture as much as possibile. Its strategic location provides access to the most beautiful trails of the Apuan Alps, on foot or by mountain bike. That way you can discover the beauty of the garfagnana you never expected! Also try our delicious produce various types of honey and local products.